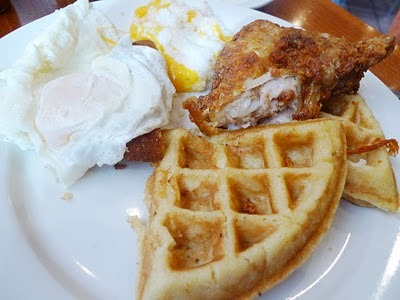 Amy Ruth’s: Waffle and Fried Chicken Breakfast – 93 Plates Part II. Saturday morning I went all the way up to Harlem for a breakfast of champions at Amy Ruth’s. I met Hagan of Wondering Foodie once again for his 93 plates project. The first time we met at Szechuan Gourmet he was at the beginning of this waist stretching journey, now at mid point, he’s added on a mere 6 lbs, not too bad considering ALL that he’s eaten so far. He’s still going strong and excited as ever, kudos to him. My first time at Amy Ruth’s was way back in college and didn’t leave a big impression, so I was looking forward to revisiting. First things first, before we even ordered, a corn breadish biscuit was brought along with water. 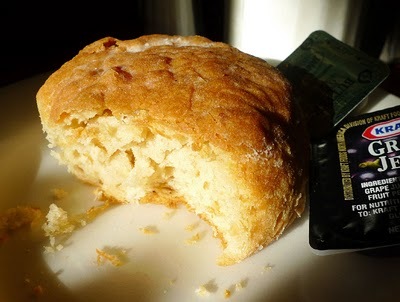 Soft and buttery with a hint of sweetness, it was hard to resist, specially with a dab of cold butter. Why must all things yummy be so bad for ya’? Hagan got the Salmon Croquette which aren’t worth mentioning. Tasted like something from a box, but the cheesy grits was so yummy, extra smooth and creamy with strings of melted cheese. Warm and oh so comforting, this was one of my favorite part of our breakfast. 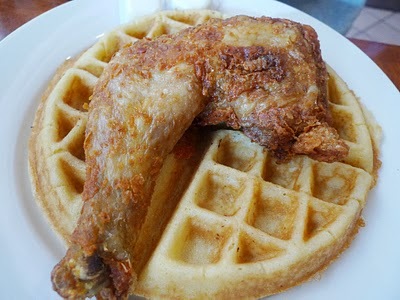 Waffles with Fried Chicken was great, not the best fried chicken I’ve ever had, but it was really moist and seasoned well. Not as crunchy or fully battered as I would of liked, but flavorful and tender. The gravy truly sealed the deal. Their brown onion gravy was amazing. Thick and purely heavenly, elevating the taste of everything it came across. 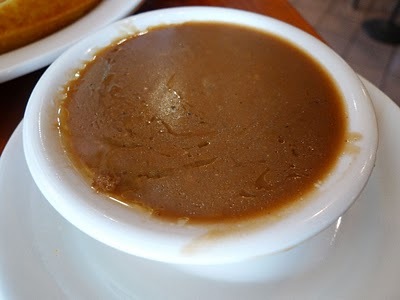 Can gravy get any better than this? I highly doubt it. The waffle and fried chicken was incomplete without it. Now I understand why people order “smothered”! I want this intensely flavorful sauce to cover me from head to toe too, yummmm. We shared our dishes, so here’s my plate pre attack. 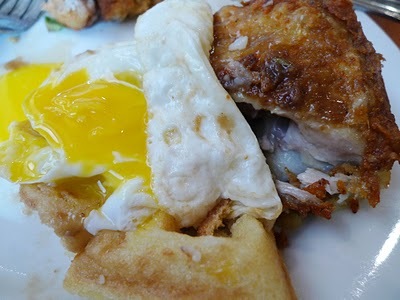 As an extra touch, I broke the yolk over the waffles and chicken, then I added spoonful of gravy on top, the wining combo for sure. Isn’t it beautiful? Hagan added an extra dose of maple syrup to the mix, not my thing, but he swears it’s like a Mc Griddle of some sort. I adore your site and assure you that it will be a big success. I think you are terrific! Wonderful review and I just like the way the whole thing is pull together. I'd love to learn how the service was even though it seemed fast food? Write me I'd love to know more. I had a refined chicken and waffles in DC at Founding Farmers but I think I must try a more authentic plate! 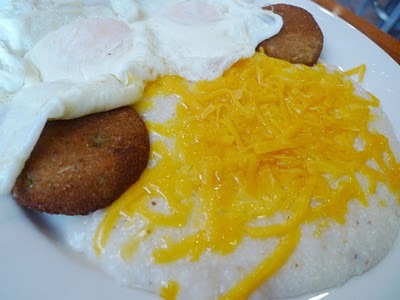 looks really good…kinda heavy for breakfast but love anything with cornbread. soo tasty!!! you can find anything in New York City, that is for sure!!! Ahhhh! Your film debut. Love it….